While the biggest talking point of 0.144 might be the decision to not include the driver for the Cave SH3 based hardware after what can only be described as a polite request from Cave to not include it just yet this is not something which bothers me especially. As a result of the work on this driver, even with it removed, MAME has gained significant improvements to the SH3/4 core (over double performance on many of the most common opcodes and a number of bug fixes making it more suitable for other applications), an audio core (the YMZ770) which could lay the groundwork for the eventual decoding of the MPEG audio in games like Star Wars Arcade (it’s very similar) as well as emulation of a number of peripheral chips such as the RTC9701 which combines a Real Time Clock and EEPROM. By comparison the actual gains made to MAME far outweigh the decision to not include the actual driver, the majority of the work I did there was these reusable parts (the SH3, the RTC) and to me it’s the basic component emulation which gives MAME it’s value as a project. Despite this, I’m once again subject to very personal attacks from a member of the development team for even looking at the driver, calling it irresponsible and stupid, which is really hypocritical when you consider that the very same developer still has a ‘4 Bitcoin’ page offering to write a MAME driver for said system if people pay him! That doesn’t both me too much either, because said developer, despite clinging on to how he’s worked on whatever AAA console games has still only ever made minor contributions to MAME/MESS. What does bother me is the loss of another feature in 0.144, far distant from the Cave stuff. In 0.141u1 the Megatech driver was updated to work with the Softlist support from MESS (which is also in MAME by default), in turn this allowed a very clean implementation of the multi-slot technology used by the system in MAME using a standard of code which has been developed over the last few years to a high standard. This was around 10 months ago, and that support has been there ever since. I was coding to an established standard, for something nobody has complained about in 10 months, inline with the way another copy of the same driver already works to facilitate some source level cleanups, and give the option to run the MVS in proper multi-slot mode, with MAME now being the only reputable NeoGeo emulator lacking that feature. At the last minute, after my submissions were accepted, that’s ALL been ripped out, but not just the NeoGeo list, the entire MegaTech list, the STV list, everything, gone, with only the internal database remaining. The very foundations which I was going to use for Multislot, gone. The existing support for Multislot in Megatech, gone. Working for Mame lately is like talking to a three headed monkey, one says one thing, the other says another, then the third disagrees with all of that and puts your contribution to waste. The reason given, apparently the software list standard isn’t good enough for MAME, it should *all* be internal. In essence I’ve been told that MAME/MESS need a *3rd* standard for ROM loading, a sort of pseudo soft-list internal hybrid. Given that this doesn’t exist yet, that means the 5 hours of work I put in already has gone to waste, and there is no actual way forward. I don’t even think this makes sense, the MESS lists are getting to the stage of being mature, the technology works well, they were ugly at first but as things stand they work well, they’re effective, and for systems with removal media like home consoles, and the MVS they represent an absolutely ideal way of representing the cart content, with better documentation value than hiding stuff in a MAME source file and greater flexibility on top of functionality, for example, you get free namespacing which really helps make things more manageable. The reasons just seem to come down to superficial stuff, the XML is ‘ugly’ (I agree, most XML is, but it’s a standard) or some false illusion that a list which isn’t hardcoded into the MAME binary has less ‘value’ than one which is, which is utter nonsense because they’re all distributed as part of the same package anyway. So, the wheel is going to have to be reinvented again, which not only seems insulting towards the MESS developers who have spent 2 years developing and maturing the softlists, but incredibly frustrating to me, because it’s now a progress blocker, and IMHO senseless anyway, the two standards we already have are mature and suit specific use cases well, introducing a third one would just be a step back 2 years and instead of concentrating on improvements to the existing softlist system to allow dynamic adding of CPUs or Dipswitchs functionality is going to have to be added back from scratch and maintained together with the rest. Such decisions just baffle me, if people had issues with the software lists there has been ample time to raise them, 10 months of the MegaTech driver using them, even longer in MESS, yet now, when real progress is being made, they get pulled? 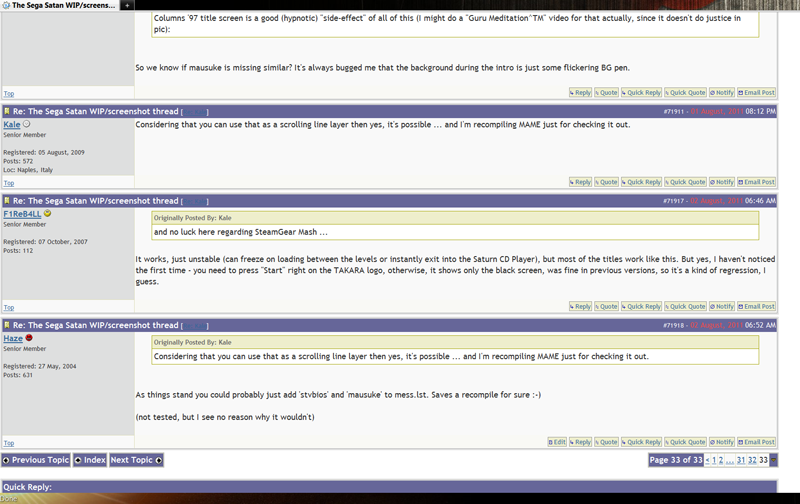 I absolutely wouldn’t advocate using Software lists for the majority of the MAME drivers, because in the majority of cases it doesn’t make sense, but in some it really does, and considering the developer involved has come out and stated he’s in favour of the project unification between MAME and MESS I can’t really think of many moves which could actually be deemed more damaging than this one in terms of not showing support for the technology developed in MESS. Maybe all this will blow over, and things will get reinstated, or reconsidered. I certainly hope so, and do have a great deal of respect in general for the developer who has vetoed this, even if I really can’t understand the reasons. The problem is when you consider that the message coming from the top of Mamedev is ‘More Action, Less Talk’ and more action just ends up being greeted with apparent contempt and culling of progress I’m getting very mixed signals which are off-putting and end up making it feel like a risk to write code for MAME, even when things seem like a dead certainty. The other irony here is that around 13 years ago there was a MAME build I was promoting and helping with called KBMAME implemented ‘softlist’ style loading for NeoGeo in MAME, in a non-xml format which seems to be what some people would rather see anyway. At the time it was met with open arms by the community, and yet 13 years later just trying to do the same thing manages to turn into a huge commotion even when there are clear benefits to be had. At the end of the day I need a standard I know I can work to, with confidence and that’s not something I consider unreasonable. *edit* The lists have been restored for 0.144, alongside the internal ones. While I’m not a big fan of the duplication this leads to it’s definitely a more amicable solution until something else is worked out. My frustrations at the original handling of this remain, but I’m glad to see some sanity has been restored ;-) From the looks of things this will be worked out further between 0.144 and 0.145 but in the meantime progress can continue. I do think that this is putting the MAME / MESS merger type stuff at a critical point tho because a solution which is fair to all needs to be found, and applied appropriately and consistently across the drivers of both projects to avoid creating further divides in standards. Just a brief update on the Fruit Emulation stuff. I’ve spent the majority of my MAME time since the last updated (several hundred hours at least) just trying to sort and categorize the various sets that are around, figuring out the hardware, splitting things into appropriate clones, identifying cases where there are missing roms etc. This has proven to be an incredibly time consuming task, not least because of the sheer volume of sets and variations on sets which exist. 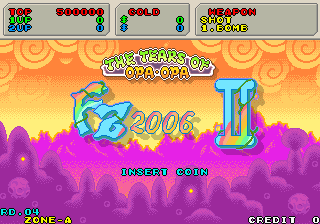 You’ll have seen in the last couple of updates there have been a lot of fruit machine romsets added, then renamed, split out, and reshuffled in cases where things were just completely misidentified before they were looked at for MAME. It’s not really what you’d call a glamorous job, but it’s one that needed doing, as proper set support underpins any further work done in MAME, so despite no real visible progress in the emulation simply doing this is a huge step forwards towards eventually seeing the machines supported properly in MAME. The majority of sets have been added now, so the number of *new* fruit machine roms added from this point in any single update should be rather small, although there is a lot of sorting and splitting to be done, which may give the illusion that a lot more is changing than really is. To begin with there was in the region of 5-6GB of sets to look at, I’m now down to around 50MB of stuff which isn’t identified by the latest MAME at all. The good news is that even if I get hit by a bus tomorrow nobody is going to have to repeat this part of the work. Give me one good reason why this helpful post I made was deleted? Compiling MAME from scratch can take near on an hour. I suggest 2 lines to change it, and achieve the same in 5 seconds, thus making testing a LOT easier, and it gets deleted. That’s how paranoid the mods over there are over MAME and MESS being associated with each other, and the reality that they’re exactly the same thing. Really, I’m 100% serious, that was deleted. It’s indefensible. I think China has more freedom than this, yet they claim it’s not political? That was an entirely legitimate way of helping. Next step they’ll probably make that impossible just to spite everybody. I’m trying my best to help MAME, even metaphorically sell it to new potential developers and users (a big part of the FME push below is for that purpose), but this kind of crap WILL drive legitimate contributors away. This is also why forking would be impossible, it would be censored in the same ways, then declared a failure. MAME has been doing a good job of emulating several video based slot machines for a while now, for the most part they’re easy enough tech to get going and if anything the more simple ones can be a pretty good starting point for understanding how to write a MAME driver. They have a few idiosyncrasies associated with them such as the need to simulate payout hopper hardware which doesn’t apply to most arcade games, but for the most part they’re just like anything else. One area that’s lacked attention in recent years however is the non-video based gamblers, which have been prominent in UK arcades since the 80s, and are in many ways just as iconic as any other classic video game. The 80s and early 90s machines especially had memorable melodies, and art, attractive patterns of flashing lights and were clearly developed by people who were interested in creating an experience that was not only about winning money, but also having fun, something which really set them apart from the majority of gamblers produced outside the UK, and the very methodical design of most video based ones. There’s no technical reason MAME can’t emulate these, and emulate them well, there are a couple of potential problems I’ll talk about later, but essentially they’re just a bunch of off-the-shelf components stuck together. The machines are in part mechanical, but really things like the fruit machine reels can’t truly be considered any more mechanical than the various input devices MAME supports, they spin under the control of the program, and their position can be read back. As a matter of fact, MAME is so adept to emulating these things that the basic codebase (CPU cores etc.) of one of the more popular existing emulators was ripped straight from an older version of MAME, as shown by a source leak. Source leak? Well yes, the emulator is ‘closed source’ in complete violation of the MAME license, although people had suspected it stole MAME cores for a long time even before the code was leaked. The MAME license is very clear, and always has been, that if you derive something from the MAME code then the source must be available. A fair number of people have come down like a ton of bricks on the author for not abiding by this, and deservedly so, based on what’s been said the team would be well within their rights to take legal action over it, especially as if reported by some, it was also previously sold. My take on this is quite simple, as long as the author agrees to release sources to any future versions as per the license agreement I don’t mind too much about the past, finding the old source trees at this point would no doubt be rather tricky. I do applaud whoever leaked the previous code to prove it wasn’t entirely an original piece of work however. The only other real caveat I can think of in terms of MAME is the timer system, I’ve noticed with the existing drivers that some set incredibly high frequency timers, especially when playing samples, this unfortunately can cause MAME to run like a dog due to some pretty severe flaws in the design when it comes to this use case. Not everything is affected, but some are. In terms of emulation the games can be incredibly finicky, testing the hardware extensively, and outright refusing to run if they detect a fault. Naturally this comes from the requirement of the original machine to be reliable, and often secure ways to deal with regulated payout amounts etc. As long as things get emulated properly this isn’t a real problem though, just extra work. In terms of what’s dumped, it’s a mess. You can find dat files documenting fruit machine ROMs, but for the most part things are poorly sorted, give no indication of hardware, have multiple hardware revisions within the same sets, and even have things which are completely misnamed. Furthermore, even beyond that many sets are just plain incomplete. I was looking at the Epoch hardware stuff and out of ~150 games only in the region of 4 actually have sound ROMs dumped, and for other systems the only complete sets are in many cases non English versions. We’ve already seen this problem even with a large number of the video based games in MAME, missing question ROMs and such. To make matters worse the community built up around the existing emulators seems to have a philosophy of ‘find a set that works and stick with it’ yet in many cases these fruit machines have multiple clones, for different payouts, different regions, in addition to bug fixes. One game I counted has in excess of 100 clone sets and the majority of these are completely untested, and some have been obviously hacked just to add insults towards people in. People seem to have attempted to make up for missing sound ROMs by substituting them with others from games which usable, but still wrong sound, and in some cases it appears where only sound ROMs were dumped, substituting missing program ROMs from games with similar gameplay. Sorting them out is going to be a complete nightmare. To make matters worse some of the emulators appear to have adopted a console ROM like format for some of the MPU5 hardware games, requiring correctly split ROMs to be merged into a single file before they work, creating further confusion. From a documentation point of view it’s a tower of neglect. It’s going to take years to sort out, and while I *greatly* appreciate the efforts of the people who have attempted to make dats for these things (I’m sure plenty has been saved from being lost as a result and it has saved me an enormous amount of time) there is still a ton of work to do. To a degree it’s understandable, it’s hard to categorize things which don’t work, if you’re lucky the games contain the title in plaintext somewhere in the ROMs, but many of the earlier ones don’t. Without being able to run the code it’s not always obvious what hardware things are, although there are usually hints based on code / data structure and that kind of thing. Where is this leading? Well, I’m not a huge fan of these games myself, but part of being involved in emulation development is keeping a level of impartiality, if as a developer you only work on drivers for games you like then you end up being rather limited in what you can do, so, I’m putting into action a plan to at least try to sort some of this out. As a first step I’ve created skeleton drivers for the common platforms, these really don’t do much yet, but they act as placeholders. Secondly, I’ve started trying to identify each and every set I can identify, and move it to the appropriate skeleton driver. For the initial pass I’m lumping all the clones in the same set (they’re too unwieldy to sort at this point) but splitting out anything which is obviously mixed in with wrong set, and adding precursory comments where things appear to be missing or bad, to mark in the correct way later. Obviously some games are on unique hardware, like anything else, and with no hardware information these will be tricker, but I’ll come back to them at a later date. Some of them are clearly things like CD jukebox ROMs and even one for a VHS player anyway, so are more likely to be put in MESS at some point if anything. Identifying the ROMs is as much about looking for common structure at the moment, obviously for already emulated stuff there is a guide, if something is running in an emulator already, it becomes rather obvious what hardware it is. 68k and H8 code can be identified by a large quantity of certain hex values in the code, which is good for splitting Impact and Epoch apart. MPU5 stuff tends to all have a similar vector table, 68xx stuff (usually MPU3/4) has vectors at the end. Maygay M1AB hardware always has a MayGay copyright string just before 0x10000. Bellfruit stuff has very specific encryption patterns. The 3rd party stuff is often hardware, especially on the earlier systems as it’s quite obvious some of it was developed by reverse engineering the hardware from scratch, and thus doesn’t conform to the same standards. Progress will also depend on exactly what degree of burnout is being felt over these things at that point. As things stand I’m doing this pretty much on my own, just bouncing a few questions off people to clarify one or two things. Many of these systems are ones where external contributors could become involved, as I’ve said near the start of the article, they’re all just combinations of off-the-shelf hardware, so emulating them shouldn’t be too difficult, but rather require a good understanding of how the components should work. In the end, if MAME can do a good enough job on these things hopefully we’ll see many benefits. First off, the petty arguments which seem to dominate the Fruit Emu scene would be done away with, for all the problems with MAME none sink quite that low. You’re guaranteed the source, and guaranteed a complete knowledge dump of everything the developers involved know, no holding back of information and such. Hopefully all the nonsense with the other emulator and stolen source will become irrelevant as MAME obsoletes it anyway. Secondly, these things will hopefully end up being properly documented, that’s going to take a long time, but the framework exists, the MAME database is a great place to make a permanent record of what’s what. Right now there is no central point of knowledge for these, neither in terms of the hardware, or software, even Googling the names of many of the machines turns up nothing which is worrying when you consider a key part of all these machines was what they looked like! Thirdly the emulation of many of the components used will improve, as I’ve said earlier, these things can be very fussy over the hardware working correctly, and will provide some excellent test cases. 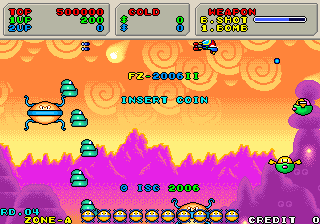 Forth, it could lead to improvements to the MAME artwork system, more flexible custom elements for things like the reels. I know one day I’d still like to see full 3D cabinet support in there and these would be a perfect showcase for something like that if it ever happens. Fifth, MAME is the ideal platform for emulating the one-off obscure boards, the majority of components you need to work with are there already, you don’t have to write (or steal!) CPU cores and sound cores just to quickly test what hardware something is, you have things at your fingertips for testing, so hopefully it will lead to many of the more obscure machines being emulated in some form too, even if finding the artwork for them will be another challenge entirely. Sixth, MAME is a platform anybody can contribute to, the compile tools are always freely available, and getting it to build it literally a one-stop process. Nothing fancy is required, if *you* want to contribute to fruit machine emulation MAME allows you to. On closing I should stress that none of this is magically going to happen overnight, the underlying message here is that there is a lot of work involved. I’ve been up all night, and asleep half the day, every day for the past week just trying to make headway into this, yet I know as soon as the next MAME update is out somebody is going to slag off the addition of these sets, because either they don’t care about them, or because nothing actually works yet without even considering the work that has gone into it so far. Anyway, this bugged me a bit, so I’ve come up with a tiny build of MAME which can run the same game but using the original data files from the PS2 disc, to use this you must simply get your PS2 disc, copy the ‘BIN.PAK’ file from it, and place it in a zip called fantzn2x.zip and run the custom version of MAME linked below using that. I’ve done the same for Bloxeed, because it looks like their bootleg of that was also sourced from one of the PS2 versions. 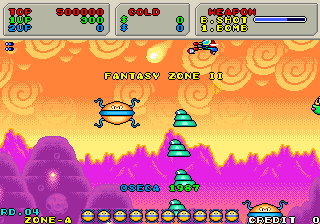 These obviously aren’t going to make their way into the official version of MAME in this form, but it’s less annoying than having to use a bootleg with hacked title screen and copyrights etc. 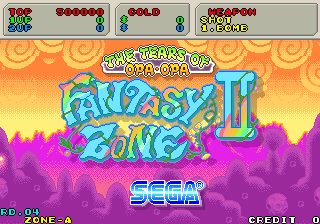 Quite why the bootleggers called it FZ2006 and used a 2006 copyright when it appears to be based off a 2008 PS2 release I don’t know, but Sega were no better really, stamping a 1987 copyright display in the attract mode. As my involvement in MAME continues to wind down I’ve decided to make a fresh start to this blog. I wanted to do a summary of all the things in MAME which I’ve been involved with, but the list was monstrous and quickly became unwieldy. I think I must have been actively involved in development on at least half of the supported titles in MAME in some capacity, be it writing the drivers from scratch, rewriting drivers based on new information, acting as support to other people, or simply fixing bugs in existing drivers when adding new supported sets and/or games. While the overall structure of the project has changed a lot over the years MAME will always be judged on the functionality it provides to the end user, the history it has documented, discoveries, and the proof in the implementation, looking through the project it still lives and breathes work I’ve done in these areas, summing it up is simply impossible not to mention unfair. Unfair? I’ve never been one to want to take credit for things I haven’t done, in fact I’ve often worked without credit, just to get things done, to help out, make things better; the project is, and always will be one of near unrivaled historical importance which is far more important than any personal gain from it. It’s also important to understand with emulation that you’re always working with things which have been created by other people. The CPU cores for example are an area I’ve had minimal involvement in (mainly just bug fixes when needed), yet without them almost none of the things I’ve emulated would have been possible. Claiming absolute credit for anything in emulation is just wrong, at least if you’re a team player in the project. I might revisit some highlights here however, some reflective insight into the highs and lows of the last 11 years of my contributions to MAME. I’ll probably still work on a few MAME things as well as posting about other things which interest me here, there’s definitely at least still the early Semicom / Jeil / Cheil game ‘Brixian‘ to come at least! I’ve previously stated my honest opinions on the direction I feel the project should head, some have agreed with that, others have disagreed, I’m still fairly certain things will end up exactly as I’ve outlined, the time period remains indefinite however. Along those lines, for anybody wanting to have access to the bleeding edge official MAME/MESS distributions (much more up to date than the u releases) I’ve added a little page which explains how. Maybe that can encourage development a little, allowing people to mirror and host daily builds, but I’m doubtful at this point. I do wonder exactly where things go from here with the project in the short term. The things I’ve highlighted in previous posts there has been little interest in (I plan a recap on that at some point), but if I was a betting man I’d probably say something like Namco System 10 was the most likely next significant system to be emulated, after all, it’s just a Playstation with some protection, nothing fancy. Beyond that it’s just tumbleweed; promising progress shown on drivers for 3D systems which ultimately get abandoned or never submitted, things nobody is interested in working on, and a couple of others which are decidedly too hard, or simply impossible. MESS is still the most likely source of real emulation progress, and advances in shared systems could be the main source of progress in MAME going forward, the recent advancements in PC emulation thanks to some external contributions could help pave the way for some PC based arcade systems, although the 386+ protected mode emulation still needs significant work before that happens. Speaking of MESS, you may notice the HazeMD stuff isn’t hosted here anymore. It’s obsolete. MESS is still using a version of my Megadrive / Genesis driver to which I’ve made many fixes since the last HazeMD release, and with the Software List support the internal database from HazeMD is already fully covered in MESS. With the latest MESS you can also take advantage of new features like the recently added HLSL shaders to give a more authentic looking output, so it makes more sense to use that. The purpose / goal of HazeMD was complete, and the only real advantage HazeMD had remaining was the old cheat system, and maybe better compatibility with some legacy hardware. This is not the end, merely a new beginning.